Desire Pearl Resort is ideally located on a stretch of secluded powdered sand beach, at the edge of the picturesque fishing village of Puerto Morelos. 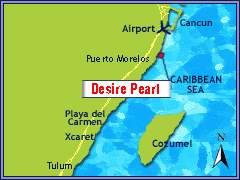 Desire Pearl Resortl with it's clothing optional venue, is only 20 minutes from Cancun Airport. Experience one of Mexico's most perfect beach resorts and the great array of attractions that are within easy reach of the resort. Some of the most significant Mayan archeological sites, a vast network of underground rivers, over 100 "cenotes" (sacred pools of clear, calm water), cave diving, scuba diving and snorkeling on Great Maya Reef and deep sea fishing are just some of the exciting things to experience while you are staying at Desire Resort Pearl. 20 km shouthwest of Cancun City.